On the edge of Miami International Airport, the terminals are less than four miles away from the Hilton. A six-mile drive southeast, you'll find Little Havana and its atmospheric Cuban shops and eateries. If you're here for a cruise, the Port of Miami is eight miles east. Miami Beach and its whirlwind of activities are 11 miles east. Historic Virginia Key Beach Park is 12 miles southeast, and the beginning of the Everglades is 14 miles west. 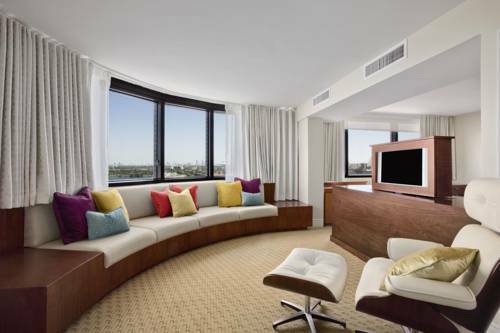 After a head-to-toe renovation in 2012, the 14-story Hilton is at the top of its game. On a peninsula extending into Blue Lagoon, the 508 accommodations have lovely views over the water. Flat-panel TVs with pay-per-view movies, minibars and coffeemakers are among the amenities. The spacious desks and ergonomic chairs are perfect when there's work to do, especially with Wi-Fi access available. 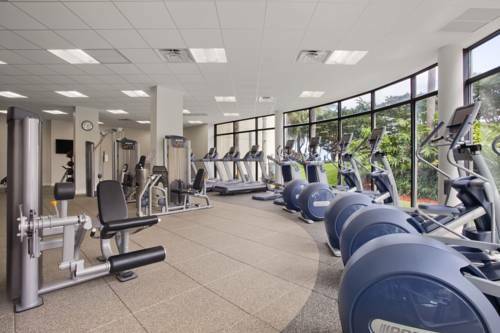 This is the perfect destination for active travelers, with its outdoor pool in a geometric design, fitness room with cardio equipment, jogging trail, basketball and tennis courts. Dining options abound, from a casual restaurant offering breakfast, lunch and dinner to an indoor cafe to a poolside bar and grill (that doesn't even count the 24-hour room service). Dry cleaning and laundry service are nice perks. A shuttle to and from the airport is on the house, and valet parking is available. 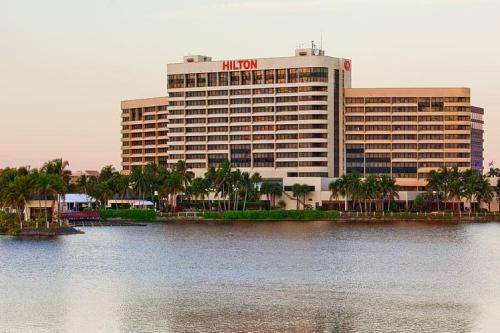 An "excellent location" with "breathtaking views" is the first of many perks at the "peaceful" Hilton Miami Airport, which has a "beautifully appointed" lobby, rooms that "could not be nicer," a "huge" pool and a "timely" airport shuttle.